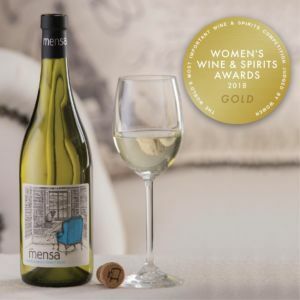 Mensa, South Africa’s first wine supported by an augmented reality app, has been lauded on the international stage with a Gold medal at the 2018 Women’s Wine & Spirits Awards (WWSA) in London. The award winning Mensa Chardonnay Pinot Noir 2018 is part of the new Mensa range just launched by Overhex Wines International, taking storytelling and consumer engagement to the next level through digital innovation. The WWSA is considered the world’s most important wine & spirits competition judged by women with the judging panel comprising 100 of the most influential female wine buyers around the globe. The organisers maintain that women purchase 80% of all wine and should therefore be the prime target for smart wine marketing. “Launched as the ultimate book club wine supported by cutting edge digital technology, Mensa certainly ticks this box. This seal of approval by the most influential wine buyers in the world is all the proof we need that we are on the right track with our new Mensa range,” says Gerhard van der Wath, owner and chairman of Overhex Wines International. The Mensa label on the bottle comes to life as a book revealing the full story of the wine when scanned using the Mensa Wine App on a smartphone. Mensa also sports the convenient Amorim Helix closure that can be twisted open and resealed by hand. Mensa wines are available countrywide and can be purchased online or at the Overhex Winery & Bistro outside Worcester. The gold medallist, Mensa Chardonnay Pinot Noir 2018, sells at the cellar door at R75 per bottle. For more information visit www.mensawines.com, or follow MensaWine on Facebook and Instagram, and @mensa_wine on Twitter. Over 1 000 wines from 38 countries around the world participated in the 2018 WWSA. Since entering the international wine arena in 2005, Overhex has emerged as one of the most dynamic South African companies competing on the world market. One of the country’s fastest growing exporters of wine, Overhex wines are enjoyed in no less than 38 countries. Headed by owner and chairman Gerhard van der Wath who practiced law for 10 years before embarking on his successful career in the wine industry, Overhex has become a major player among South Africa’s new generation wine companies. Besides their own established market-driven brands ranging from entry level to ultra-premium, including Balance, Mensa and Survivor wines, they also focus on the provision of cutting edge solutions under private labels for clients across the globe.